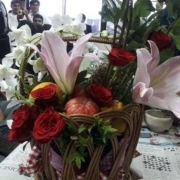 Fruit and Flower Bouquet – This beautiful flower basket is kept as an amenity in the room. It is also used as a gift for your loved ones. The students of Diploma in Hotel Management and BBA Hotel Management got valuable hands-on experience in the art of flower arrangement where they could also explore the creative side of their persona. Mr. Khan says ” Such skill-based learning sessions are certainly the right steps” for an organization that continuously strives to be among the Top Hotel Management colleges in India.